French Siege Artillery & Dutch Garrison Guns. 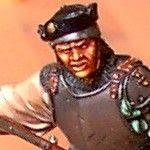 I managed to acquire some artillery produced by 'Warfare miniatures' through the 'League of Augsburg' at http://www.leagueofaugsburg.com/shop/products-cat-16-15.html comprising of a French positional gun in traditional colours of red gun carriage and bronze gun barrel. Wooden planking using 2mm scored plasticard mounted on matchsticks. I thought about adding some foliage to the base later though this would be trampled down pretty quickly with bushes removed and ground levelled off by the army engineers. French Siege Artillery, gunners match made out of wire rod with fuse wire wrapped around and painted. A Dutch positional gun in traditional colours of red gun carriage and black painted gun barrel. A French heavy mortar in traditional colours of red gun carriage and bronze gun barrel. A Dutch garrison mortar in traditional colours of red gun carriage and black painted gun barrel. I think the mortar crew are away at Tiffin. Also from NorthStar a supply wagon to create a supply dump vignette. barrels from Hinds figures ltd.
Supply wagon with Amsterdam munition mark funded by that city. Of course I need to acquire and paint the gun crew next. And at least one remaining Dutch Infantry Regiment to paint. And some gun emplacements with Gabions etc. Oh and of course a walled town....not sure how I'm going to tackle that one!?! 4mm Grass Tufts (made to order). 28mm Ancient Spartan Greek Army - The Peloponnesian Wars. 28mm Ancient Athenian Greek Army - The Peloponnesian Wars. peterw3169. Simple theme. Powered by Blogger.